Joe is from Co. Kildare and is a keen farmer. He has worked with cattle for many years and looks forward to pursuing a career with thoroughbreds. Joe will be heading to Yellowford Farm for the year which is owned and managed by Frank Motherway. Zoe has completed an equine business degree in Maynooth University. From Co. Carlow, Zoe is keen to develop her skills in the equine industry and learn all aspects involved in a stud. John McEnery and his team from Rossenarra Stud will be hosting Zoe for the year providing her with a fantastic opportunity to further develop her ambitions for a career in the thoroughbred industry. Based in Co. Meath Chloe has many years’ experience with horses. Having completed her equine studies in the Curragh she is keen to get more involved in the thoroughbred industry. Chloe will be placed with William and John Flood at Boardsmill Stud for the duration of the programme. Amber hails from Co. Wicklow and will be placed with Olive O’Connor Bloodstock. Amber has a passion for animals. She has been involved in horses from an early age and is keen to develop a career in the industry. Amber has already gained experience with mares and foals and is keen to explore other aspects to stud life. Harriet is from Co. Laois and has been involved with horses for many years. She is keen to develop a career in the breeding industry. She will be placed at Staffordstown Stud where she will gain plenty of learning opportunities. 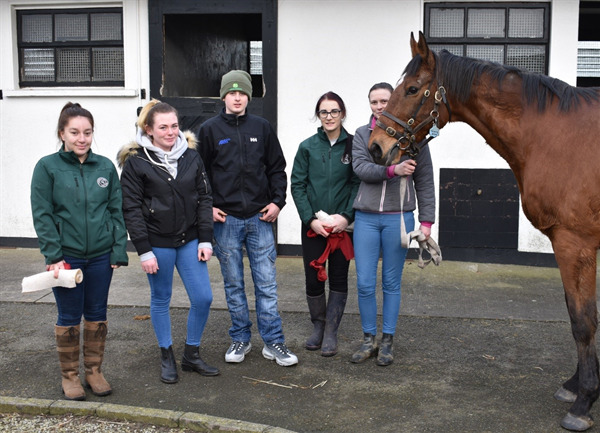 Commenting on Wednesdays’ launch, apprenticeship coordinator Issy Carroll says, “We would firstly like to thank The Irish National Stud for their assistance with the induction course last Wednesday. We are very excited about the scheme and are confident that we have an enthusiastic group of young people. This is an invaluable opportunity for the five apprentices and alongside the chosen studs we will support them throughout the process”. Throughout the placement apprentices will learn the basic skills required to work on a stud farm. This will involve both personal and professional mentoring from both employer and the ITBA.